Paiste's legendary 2002 series defined the cymbal sound of generations of drummers worldwide. 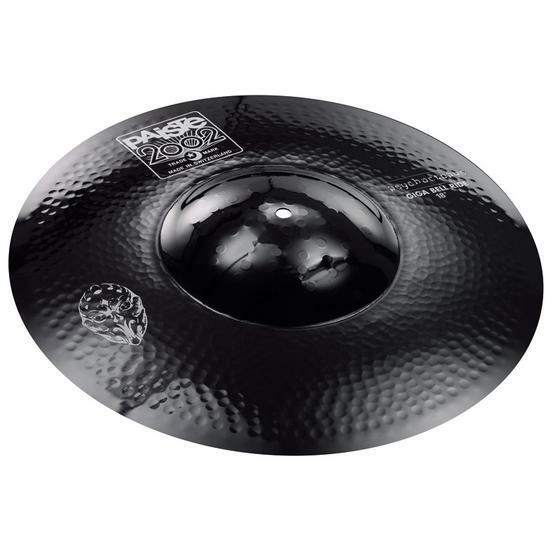 Developed in cooperation with Brazil's top Heavy Metal drummer Aquiles Priester, the 18" Giga Bell Ride is an extraordinary Ride, suited particularly for playing on the bell in various musical styles. Sound Character: Very bright, glassy, slightly dry, cutting, metallic. Fairly narrow range, clean mix. Somewhat heavy, but controllable feel. Clear, glassy ping over bell-like wash. Extremely cutting, loud bell with dark undertone. Extraordinary ride, suited particularly for defined playing on the bell in various musical styles. Developed in co-operation with Brazilians Top Heavy Metal drummer Aquiles Priester. Very bright, glassy, slightly dry, cutting, metallic. Fairly narrow range, clean mix. Somewhat heavy, but controllable feel. Clear, glassy ping over bell-like wash. Extremely cutting, loud bell with dark undertone. Extraordinary ride, suited particularly for defined playing on the bell in various musical styles. Developed in co-operation with Brazilian’s Top Heavy Metal drummer Aquiles Priester.